"The magazine’s still different to any other art magazine as it’s dedicated to painting, has painter-only contributors and uniquely has no adverts to fund it. Quite an achievement." Our interview with Art Magazine, Gallery and Art School: Turps Banana. We spoke to Phillip Allen who is coordinator at Turps Banana's Painting Studio Programme and a mentor on the Correspondence Course. When did you first get to hear about Turps Banana? I remember seeing the first Turps Banana magazine in the old Foyle’s bookshop in Charing Cross road around 2005. Foyles always used to have a great selection of art magazines there - Artforum, Art in America, Frieze etc and I would often go in and flick through them. Anyway, one day I was in there and in the middle of the rack was this bright yellow magazine with a Warhol-esque image of a Banana, I thought “what the hell is this?” as it was quite unlike anything on the stand. It was Turps Banana - I bought it. The magazine’s still different to any other art magazine as it’s dedicated to painting, has painter-only contributors and uniquely has no adverts to fund it. Quite an achievement. It soon transpired to me that it was founded by two artists based in London; Marcus Harvey and Pete Ashton Jones. Through friends and friends of friends I ended up eventually meeting them both; Pete I first met at a private view and Marcus when I was invited to do a talk at the Turps Banana art school many years later. …and the magazine is still going strong? Yes, very much so. The editors Marcus Harvey and Phil King have recently visited Berlin to interview Jonathan Meese and catch up with Sarah Lucas for the new issue out on 22 July. The previous issue was guest edited by New York painter Thomas Nozkowski and featured a whole lot of New York painters. The magazine’s still great, something unique and going from strength to strength. You mentioned that you met Marcus Harvey at the Turps Banana Art School, what’s that and how did you get involved? The art school was set up the Autumn of 2012 by Peter Ashton Jones, Marcus Harvey and Helen Hayward, and was located in the old biscuit factory in Bermondsey. It incorporated the Turps Studio Painting Programme and an innovative online project, the Turps Correspondence Course. They had one side of the 3rd or 4th floor which I think was Phyllida Barlow’s old studio. They had converted it into painting studios and started with a cohort of around Twelve painters. I was invited to do a talk and a few crits. I can’t emphasis how impressed I was. There was this energy about the place and an atmosphere unlike anything I’d encountered. Turps then relocated to the present location at Taplow House in Elephant & Castle, South East London in 2014. At that time I was asked if I wanted to help organise the Studio Painting Programme, which of course was a no brainer. 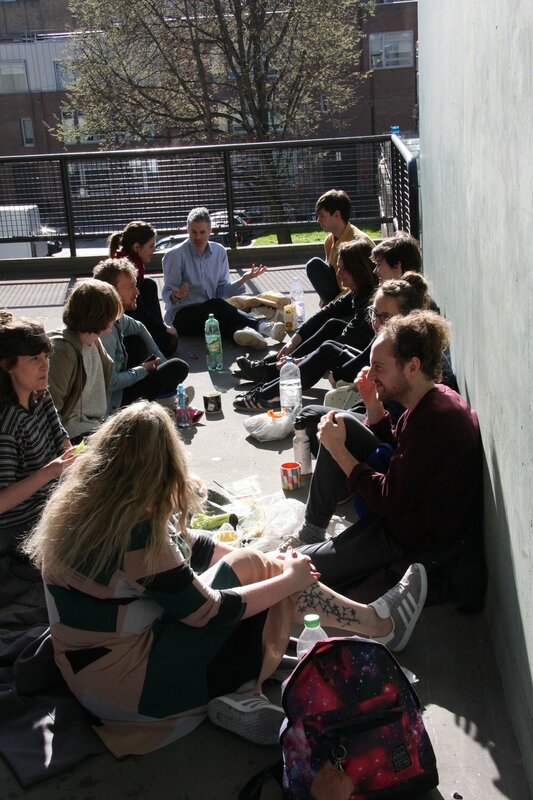 It has now expanded to twenty-four painters in the studios with an optional second year. Really well. Taplow House is a typical Post War, brutalist inner London housing estate and we occupy 5 units on the first floor. The residents have accepted us very well and there is a real community feel to the place. The Painting Studio Programme is as lively and energetic as ever, providing mentoring and peer led learning with talks and visitors in an open studio environment. The on-line Correspondence Course is doing remarkably well and we’re getting ready for the next influx of painter/correspondents this September. Visitors? Who comes to visit you? I organise range of artist talks and visits, this year we’ve had: Genieve Figgis, Simon Bill, Kate Lyddon, Katy Moran, Eddie Peake and Geraldine Swayne to name just a few. It’s so interesting hearing all these great artists talk about their work in a fairly informal and relaxed environment, painters talking to painters about painting. And now Turps Banana has a gallery.. Yes, it’s next door to the studios and so it’s kind of ideal. We’ve just shown Covadonga Valdes and are about to do a group show with Jake Clark, Howard Rogers and Nelson Diplexcito followed by a show of Tim Allen’s big abstract paintings curated by Juan Bolivar.